PHOTOS BY CHRIS KELLY staff Steve Krapes of Middletown sprays down a plane that was washed by members of the Monmouth Area Flying Club during its annual "Plane Wash" on May 20. The club is based at the Lakewood Airport. LAKEWOOD - Ask those who can fly an airplane what it feels like and they will wax poetic about the sense of being free - even when the cost to do so is nowhere near the same. But the Monmouth Area Flying Club (MAFC), headquartered at Lakewood Airport, prides itself on keeping costs down to extend the feeling of freedom to anyone, according to Board of Trustees member Eric Doeler of Marlboro. Despite living in an age in which fuel and insurance costs have soared, the MAFC has seen "a resurgence of people wanting to join," Doeler said. The club owns, maintains and insures five aircraft and has about 100 members from the region, including members from New York City. 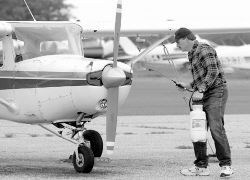 The MAFC owns two Cessna four-seat planes, two Piper four-seat planes and a Cessna two-seat plane; $35 in monthly dues, a $400 initiation fee and the cost of "fly time" gets a person airborne, according to Doeler. Stephanie Shonk of Allentown towel dries one of the five planes owned by the Monmouth Area Flying Club. The club, which has about 100 members, flies out of Lakewood Airport. "[Prospective members] need a sponsor in the club, but if someone comes in off the street, we'll hook them up with someone. It's not for everybody, but it's for anybody that has a desire to do it. The club is perfect for that person," he said. According to Doeler, the club was started in the late 1950s by personnel at Fort Monmouth, Eatontown, and had something to do with training military pilots. In the 1960s the military intended to ground the flying club, but a group of members rallied behind the organization and it was allowed to continue. Eventually, the flying group moved to Marlboro Airport and became the nonprofit, private club it remains today. The Marlboro Airport was closed several years ago, sending the Monmouth club to Lakewood, Ocean County. 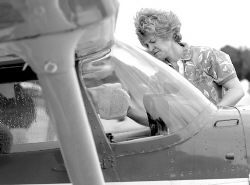 "We are a group of people that always had a desire to fly," Doeler said. "We all share in expenses and we basically rent the planes from ourselves. We concentrate on primary training." After a person is admitted to what Doeler described as a laid-back club, the student will begin his or her training. "We'll give them a list of instructors and let them conduct their own interview process," he said. "You have to pick someone that works with you. You have to go with your gut if you like flying with them for a few hours." Doeler, who has been charged with helping many of the new members, said, "you fly right away in the pilot's seat, the left seat. You're flying from the first time you get in the plane; to what extent depends on your own abilities." Pilots train to obtain a license, a process which comes easier from some people and harder for others. "It typically takes 50 to 90 hours [of training] unless someone is ultra sharp with the mental and physical [aspects] of flying," Doeler explained. "Youth usually wins. Us old guys, when we get it, we get it pretty good, though." One a pilot has his license the sky's the limit. He is free to enjoy things like the $100 Atlantic City hamburger. Doeler said many pilots make trips to places like Atlantic City just to grab a $4 snack. With the plane rental fee, the trip ends up costing $100. Thus, the $100 hamburger was born. A plane's hourly rental rate to a pilot includes maintenance, insurance and fuel costs and ranges from about $70 to about $93 per hour. This set-up does not require a pilot to own his own plane or provide his own insurance. Doeler said Lakewood Airport is an ideal location for beginners. "It's open down here, it's a great place to fly," he said, noting that Marlboro Airport, on Route 79, was known for difficult navigation. The Lakewood Airport will be undergoing improvements with a $700,000 grant from the Federal Aviation Administration and the U.S. Department of Transportation. The state Department of Transportation has provided a $150,000 grant for the removal of stumps and brush at the end of each runway and $200,000 to repair cracks and markings on runways and to install Runway End Indicator Lights. "For me and anyone who does it, it's an absolute blast," Doeler said of his membership in the flying club. "I always wanted to fly." He said pilots love "the joy of flying, the people we meet and the freedom." For more information visit the Internet Web site www.flymafc.com. Ads have a Patent Pending.